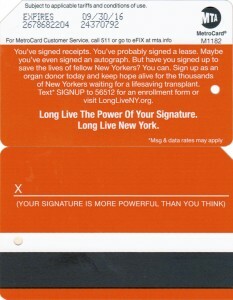 Advertisement for the good cause: sign up as an organ donor. 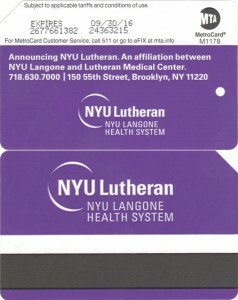 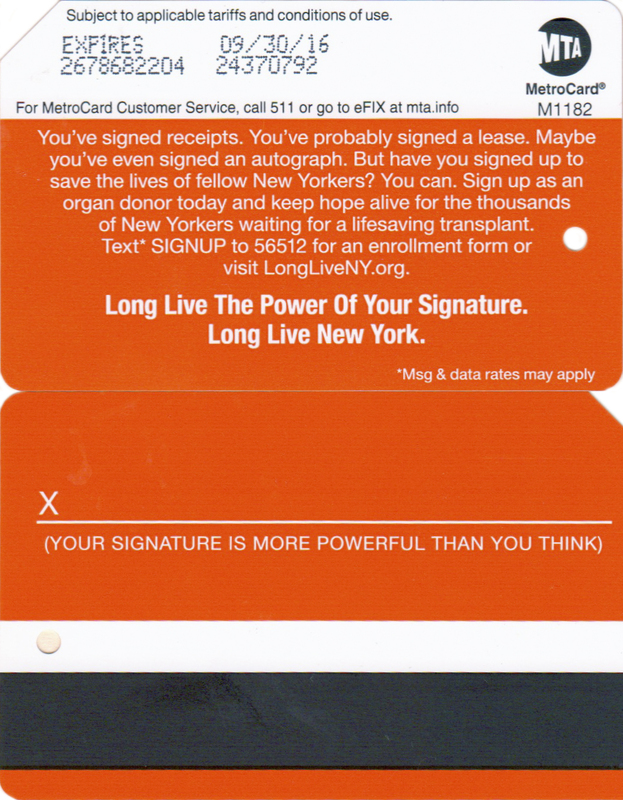 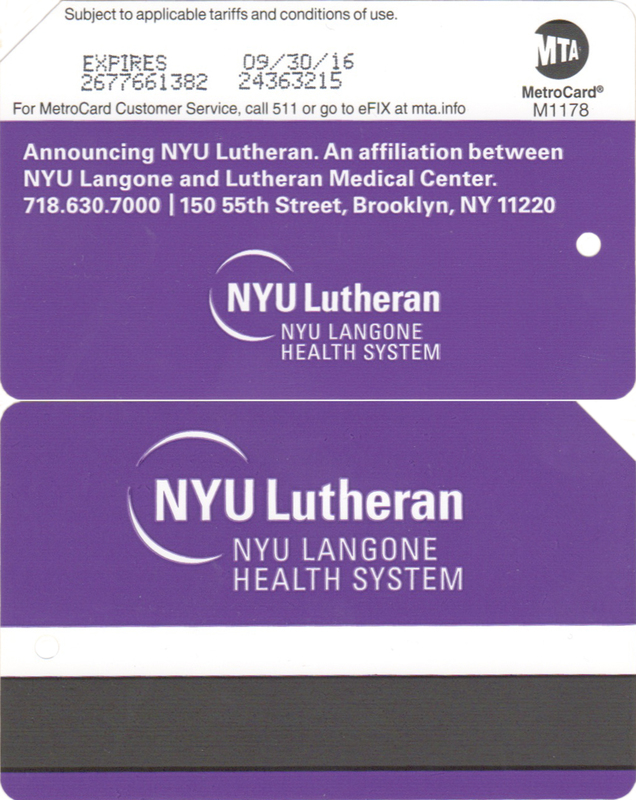 NYU Langone Health System sponsored second card: NYU Lutheran, medical center in Brooklyn, NY. 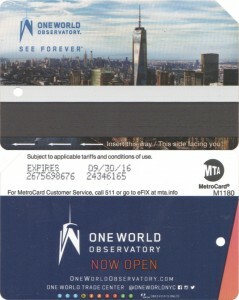 One World Trade Center has been opened and observatory built on top was promoted on metrocard: One World observatory – see forever. 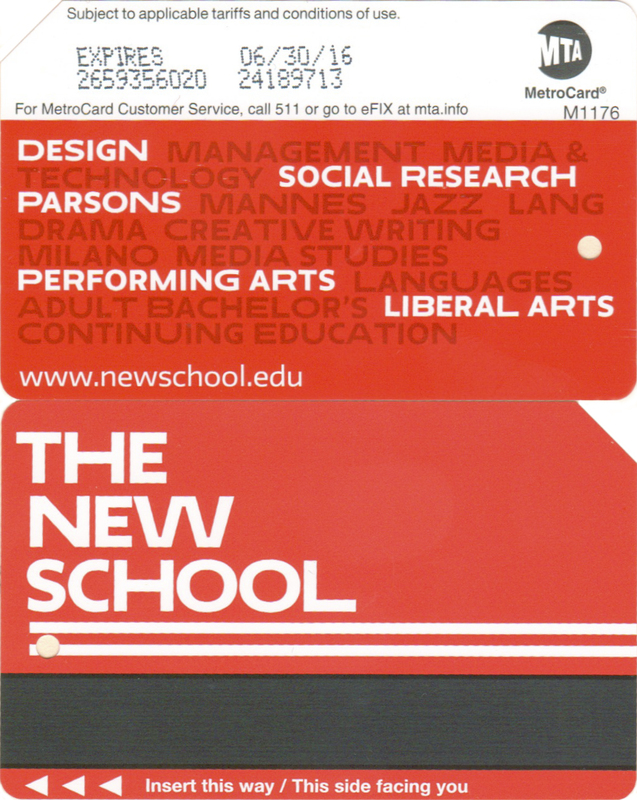 This is third college to put advertisement on metrocard after NYU and College of New Rochelle. 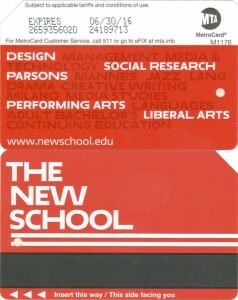 New School has campuses around New York City and main one is on 14th street. 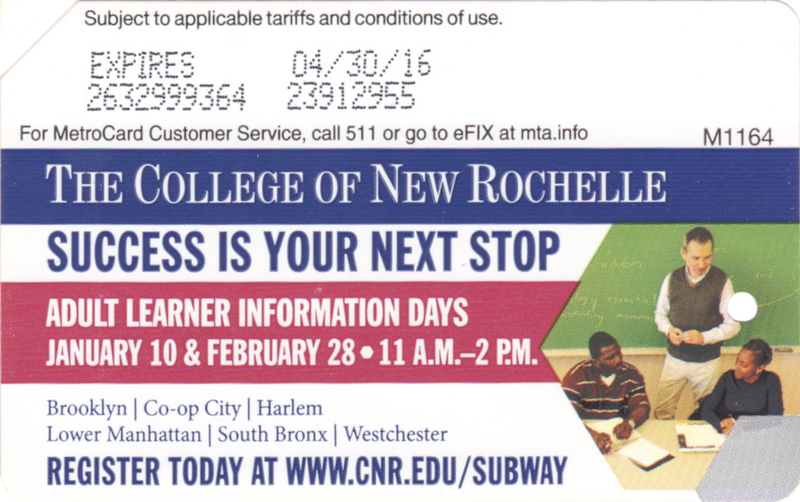 The college of New Rochelle opened branches in New York: Brooklyn, the Bronx, Manhattan. 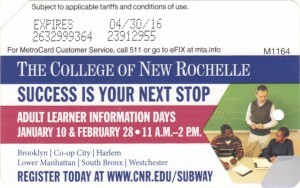 Metrocard advertised this college registration days. 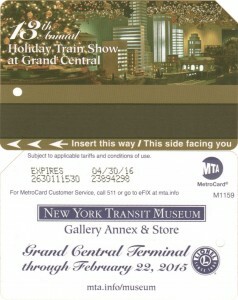 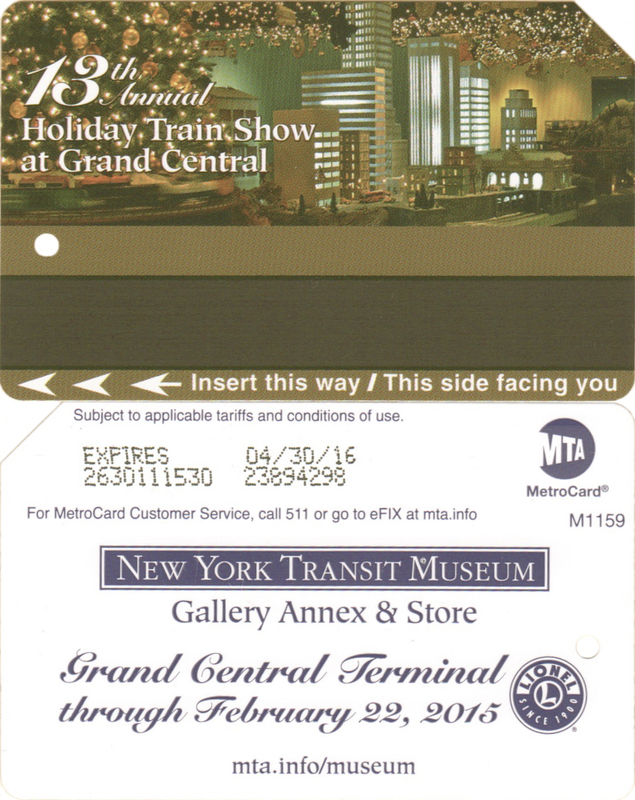 To commemorate 13th anniversary holiday train show at transit museum annex at Grand Central Terminal MTA issued double sided colorful metrocard. 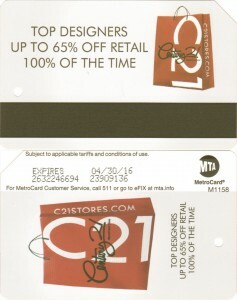 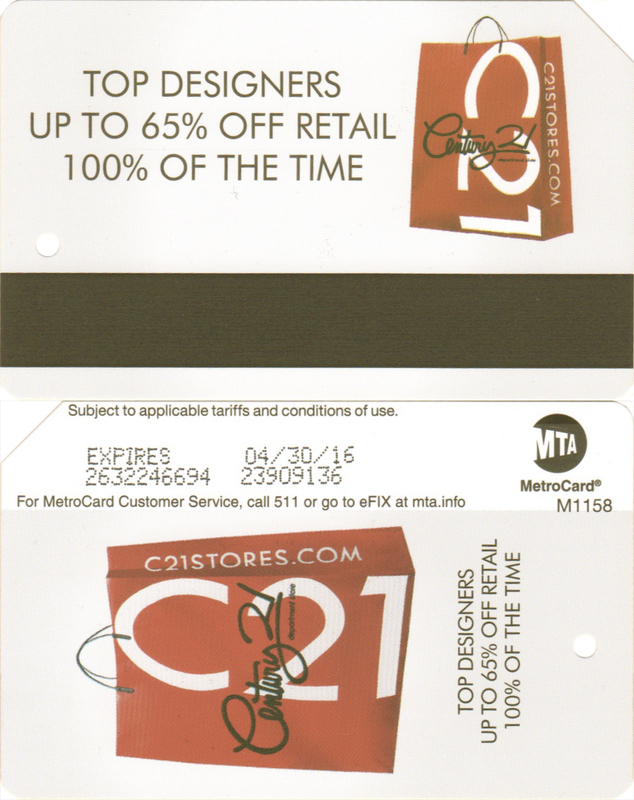 Century 21 department store which has now more locations in New York paid for 2014 advertisement on double sided metrocard albeit no promotions this year. 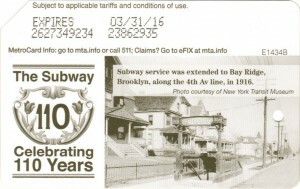 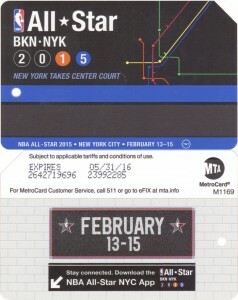 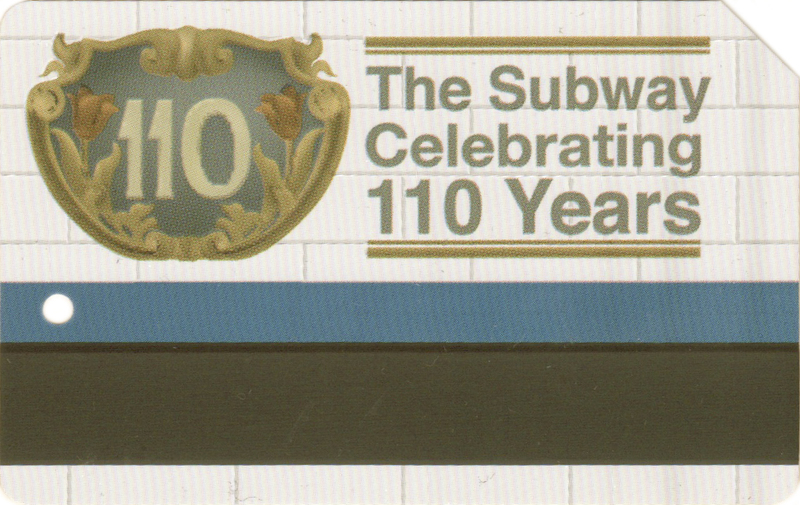 In the end of 2014 MTA issued series of 4 metrocards to celebrate 110 years anniversary of the opening subway lines in New York. 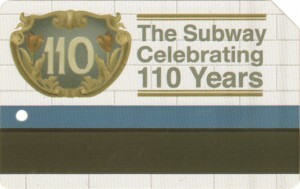 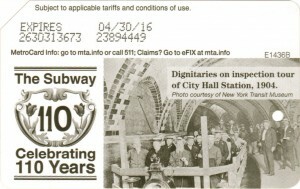 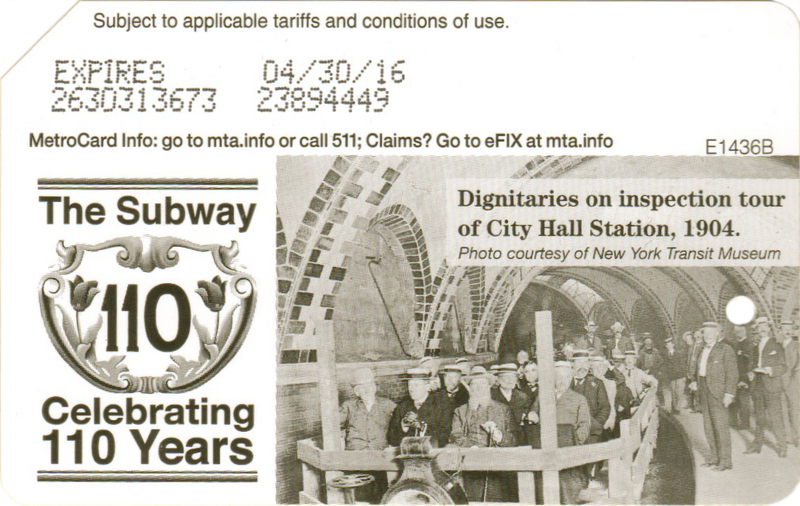 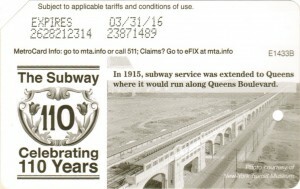 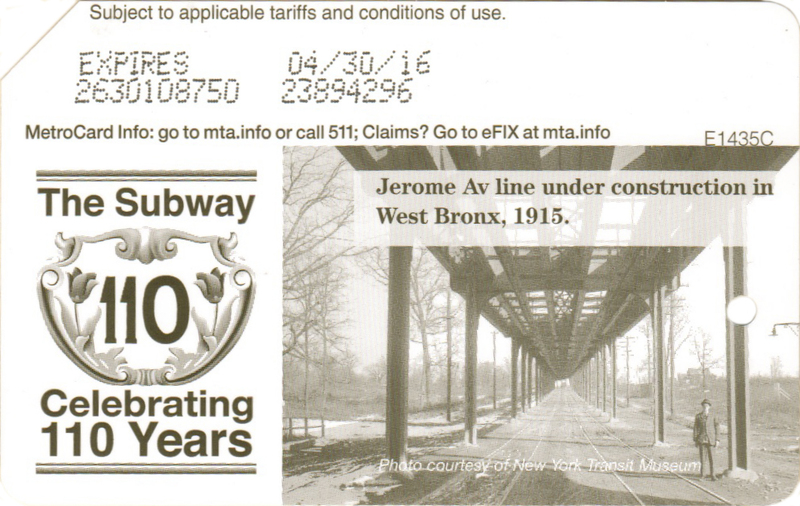 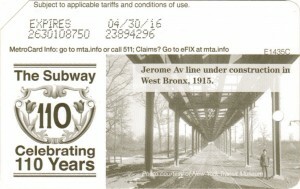 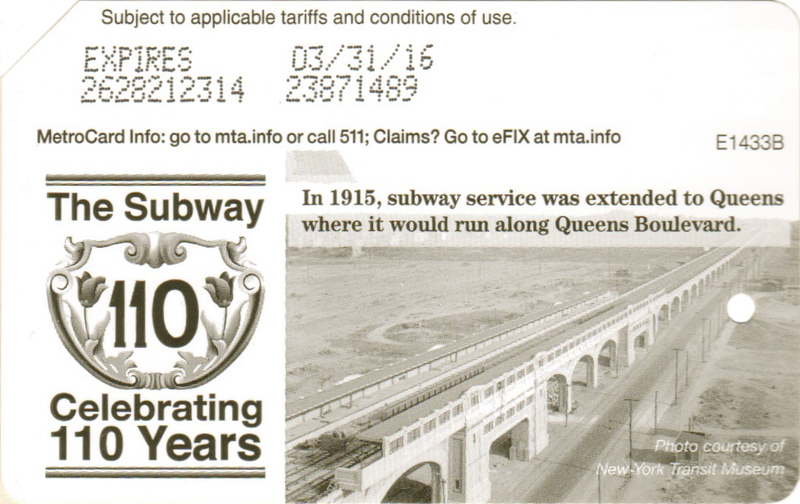 Images on all 4 cards are the same as you can find on similar cards issued by MTA to celebrate 100 years subway anniversary. 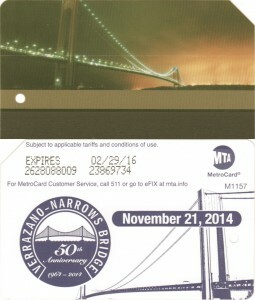 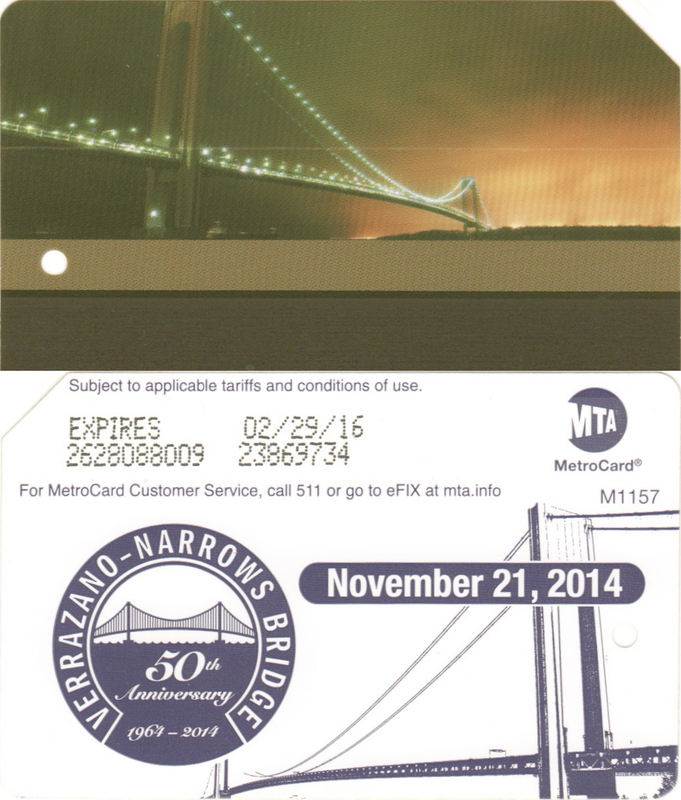 On November 21, 2014 MTA celebrated 50th anniversary of the opening Verrazano-Narrows Bridge. For this occasion new metrocard has been issued.